Those who woke up yesterday morning hoping for clearer skies and fresh air because of the downpour on Monday night were sorely disappointed, as air quality deteriorated despite the rain. The 24-hour Pollutant Standards Index (PSI), a measure of air quality here, climbed to very unhealthy levels at 4am yesterday. The three-hour PSI also peaked at 250 at 2pm yesterday. Experts The Straits Times spoke to said this was because it rained here, not on the fires in Indonesia from where the haze is being blown by unfavourable winds. Associate Professor Richard Webster, an expert in environmental chemistry from the Nanyang Technological University's School of Physical and Mathematical Sciences, said: "It is likely that the rain was very localised in Singapore and did not affect any of the fires in Indonesia. So as soon as the rain stopped, the haze appeared again. "The only way the rain can help in the long term is if it falls directly on the areas with the fires." Monday night's rain also left a strong burning smell and smoky conditions. 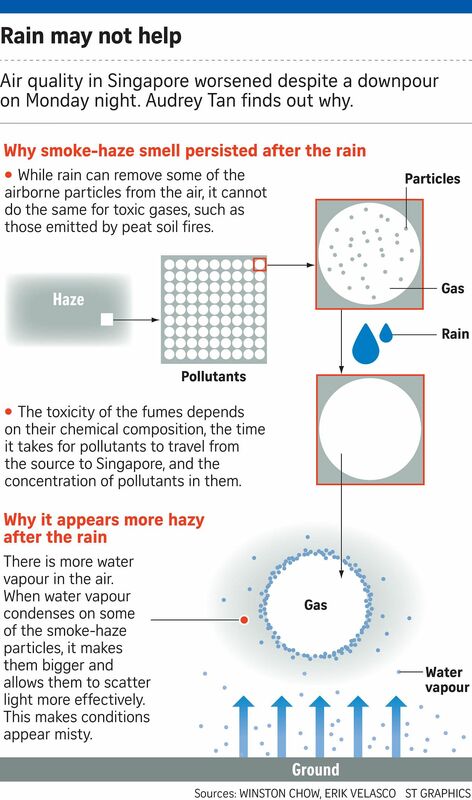 Dr Erik Velasco, a research scientist from the Singapore-MIT Alliance for Research and Technology, said that while rain can remove some of the airborne particles from the air, it cannot do the same for toxic gases, such as those emitted by peat soil fires. "The acrid smell of the smoke-haze is associated with those gases, so after the rain, we can still sense it," Dr Velasco said. However, he noted that whether the smell became stronger after the rain was subjective. He added: "We should analyse the chemical composition of such gases in real time to know more about their toxicity." National University of Singapore geographer Winston Chow added that the misty conditions experienced after the rain were due to water vapour in the air. He said: "When the air is humid enough, like it was on Monday before and after the storm, the water vapour in the air tends to condense on some of the smoke haze particles. "This condensation makes the smoke particles increase in size, scattering light more effectively. This makes the haze appear more smoky or dull grey in appearance… which is what we saw." Nevertheless, Dr Velasco said intense and long periods of rain, such as the one on Monday, are good for Singapore. He explained: "Although the sky looks hazy after the rain and many toxic gases remain in the air, it will remove particles and give us some relief."